I watched some of the 2014 Winter Olympics last night. To my surprise, there was an African American speed skater competing. His name is Shani Davis. Speed skating is not a sport you see black people playing that much. 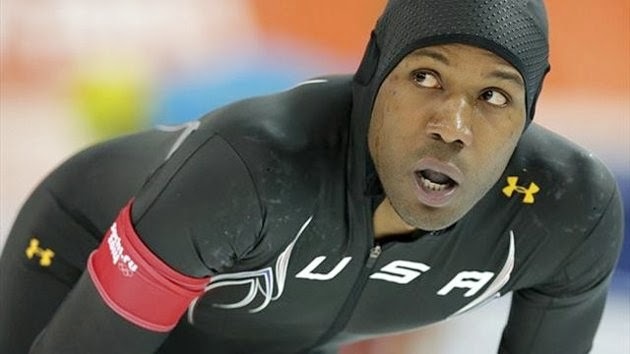 Shani Davis finished only in 11th place in the 1,500 meter event yesterday. It was very disappointing finish for team USA. However, I think he has great potential. I know how he can win the 2018 Winter Olympics. You know how in greyhound racing they have the greyhounds chasing that mechanical rabbit? Put that equipment on the track and replace the rabbit with a bucket of chicken wings and have Shani Davis chase that. Team USA will then win the gold!! !